Inbhear Sceine is a lovely development of 4* homes on the shores of beautiful Kenmare Bay Estuary on the Ring of Kerry. 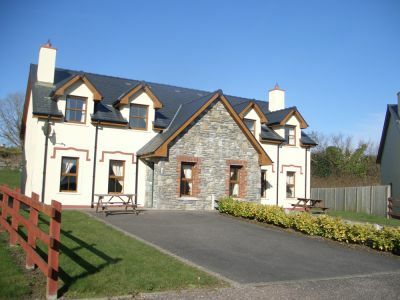 It is situated just over a 10 minute walk from Kenmare along a well-lit, level road with wide footpaths.The houses in Inbhear Sceine are bright and spacious and can accommodate 6 people.The houses have views of the landscaped gardens and environs. The houses are 3 bedroomed with a double room ensuite, one twin room and one single room Sleeping 5/6. The downstairs is open plan and is particularly comfortable as it has been stylishly furnished with all your comforts in mind. There is a colour TV and DVD player along with a cozy fireplace containing an electric fire. All houses at Inbhear Sceine have free to air satellite TV installed offering a great variety of UK, European and international tv channels. Inbhear Sceine Waterside Homes are heated with gold sheild electric heating. Bed linen is supplied – bed linen is crisp and clean and 100% white cotton. From Cork/Killarney via the N22(most popular access)From N22, turn off to the R569 signposted Kenmare Inbhear Sceine is approximately one mile before the town centre on your left hand side, (just after a row of period cottages called Killowen cottages) and is signposted. From Killarney via the N71 over Moll’s Gap. Travel through Kenmare town direction Cork. Inbhear Sceine is apporximately onw mile outside the town on your right hand side (just after old church ruins) and is signposted.